Very exciting! Certainly wasn’t a dull opening for you guys, but you persevered! I know a lot of people in the San Gabriel Valley didn’t get on the new extended Gold Line this morning because they thought it was still closed due to the accident on Sunday. Many of them ended up taking Metrolink. I walked to Arcadia this a.m. and waited about 5 minutes for a train, although the board said it would be longer. At 9 a.m., the parking appeared to be full or mostly full from what I could see of the 2nd floor/roof. It would have been nice if Metro had provided an update using the platform variable message system regarding the issues caused by the big rig accident. I was out there at 6 am and had no idea. That had been resolved prior to start of service, and alerts were issued as well. To provide feedback on station announcements or displays, please email CustomerRelations@metro.net. Got to Monrovia Station at 6:45 AM today, 3/7, & had to wait 30 minutes for the next train to Union Station to arrive … & train was full so we were standing all the way to Union Station … what a mess … I’m guessing & hoping it’ll get better tomorrow. Had a good and crowded ride on the Gold Line this morning to Union Station.. I think it took more than the advertised 33 minutes to get there from Arcadia, though.. We left about 7:20am and arrived at Union Station just before 8:00am.. Really glad to avoid the drive today, though! Instead of driving to El Monte Station and taking a Silver downtown, I took the Gold from Duarte to Union Station. Of course, at 5:30am there was no problem parking. The train had to slow/stop a few times to maintain a safe distance from an earlier train. So it took maybe 10 minutes longer than scheduled. Nice smooth ride with points deducted for rock-hard seating and a high-decibel fan system. Will additional cars be added to the morning commute, now that the lines have been extended? At 6:30 this morning, the train pulling into Sierra Madre Villa Station from Arcadia was quite full, which made it quite crowded for such an early commute. Being able to travel farther without using individual cars is good for the Los Angeles area. The APU/Citrus College Station was pretty full by 6:15 am. Not sure what will happen for those commuters who arrive later. I still don’t understand why the less dense San Gabriel Valley received a rail line before the more densely populated San Fernando Valley. The SFV only has two stations. It is just wrong that there is no rail to the West SFV. And realistically the Red Line should continue north to at least San Fernando and more likely should go all the way to Santa Clarita. Jon, the SFV has historically been anti-transit, fighting every improvement including the Orange Line. You can thank SFV NIMBYs for the lack of rail transit. They even made effective rail transit against the LAW – look up Robin’s law, which was only recently repealed. Meanwhile, the San Gabriel Valley mobilized to support transit and get this line built. While the SFV fought transit and the supposed “crime and crowds” rail would bring, SGV embraced it. That’s why the SFV is now behind and only beginning to cry out for rail. Blame your fellow SFV citizens and your own local politicians for your lack of rail today. I think its a really amazing thing that for so long communities fought to keep Metro Rail out. Now everyone is clawing at it to get it in. The NIMBYs have become the YIMBYs. I’m all for light-rail lines crisscrossing L.A. County and still await true leadership on public transportation that will starve freeway expansion projects. But Rose asks the question of the day: Why can’t Metro see the wonderful opportunity offered by the first week of the extended Gold Line and add extra cars to accommodate the new riders? What better way to welcome aboard the new riders and reward the loyal ones. What are Metro planners thinking? As an earlier person replied, I also usually drive to El Monte Station and take either the Silver Line or Silver Streak. Today however I drove to Irwindale Station. Ample parking and my train got there less than the electronic billboard announced it. Everything went smooth. Got a good seat and ride was in my opinion, pretty fast. I gather Metro will make car adjustments going forward due to the overcrowding along the route. I will definitely be riding 90 % of the time if not always. I love it…I was there at the opening ceremony. I rode it on Saturday. Its been a long time in the making, and we finally have the train to Azusa. This is such a great moment for everyone that rides public transportation. No more driving to Pasadena to hop on a train. Can drive right to Citrus/APU and park and hop on. Just looking forward to when they get the roadway to the Citrus/APU station completed so we don’t have to drive all the way around. So much easier to get to Dodger games or even Staples Center now….I certainly cant wait til May 20th when the Expo line opens up to Santa Monica. Can finally take a train from Azusa to Santa Monica and pay only $1.75. Thank You Metro for getting this done. APU/Citrus College Station parking was full by 7 am! Drove over to Azusa Downtown and found parking there. Also, Red Line TAP charged me a second $1.75 instead of free transfer. (TAP said they know about problem and should have it fixed by end of day). Nice easy ride compared to my usual stressful drive on the 210/10 to DTLA. Oh my gosh! The trains and parking lots are full! This is a disaster! All kidding aside, these comments reflect a vibrant start to a system undergoing expected growing pains. Nobody knows exactly how and when people want to ride, and everybody (Metro and patrons) will have to be patient as people adjust their behavior. My guess is that there were a lot of curious folks who wanted to be the first one on their block to ride a train to work or school, but many of those will switch back to their cars for whatever reason. 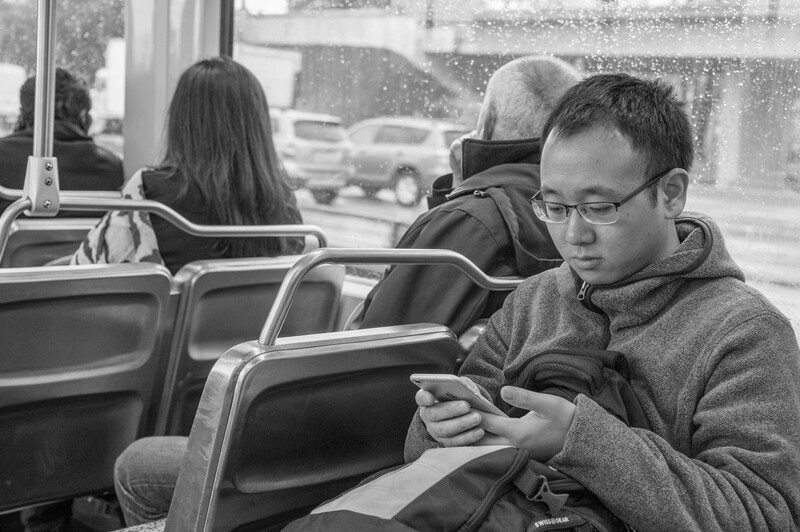 As the days and weeks pass, people will change their travel habits to be more predictable. Patrons will change their travel times to either find a parking space or avoid crowded trains. Also, passengers in Pasadena will learn to time their arrival at their Gold Line stations to avoid the Azusa trains with limited seating. If trains are still full, Metro can enhance service at peak times by either running longer trains, or running more trains to Azusa, but that will have to wait until the new trains are completed and delivered. Good luck Gold Line! Now counting the days (74) until Expo Phase 2 opens, and then I’ll have to share my train with those folks from Santa Monica. I got to APU okay, but the lack of even a pedestrian walkway from the station directly to Citrus is a pain. I’m still not entirely clear on where I’ll wait for the Metro-provided shuttle to pick me up for my return trip home (although I’m certainly glad that the shuttle is provided). Unfortunately the extension of Citrus Avenue to Foothill Boulevard (and Citrus College and APU) was not yet completed by a developer. It’s certainly not ideal now — but that’s a problem that should be resolved in the next few months. The shuttle stops outside the parking structure next to the dead end on the east side of the station, and going the other way stops at the corner of Foothill and Citrus in the eastbound direction (it then spins around inside Citrus College before coming out). When I came to work this morning, I was dropped off at the correct location you describe (Foothill and Citrus… eastbound direction) and thus have now seen the posted sign. The guy the previous day dropped me off at Citrus College itself, which was fine for getting me close enough to walk the rest of the way to APU, but left me VERY confused and frustrated when it came time to go home. I ended up walking the ENTIRE way up Palm, and around Roseville, to get to the entryway on the (from there) FAR side of the station. Not even being able to enter the station from the West side meant a LOT of extra walking for me. Thankfully, I don’t think I’ll have to do that again. 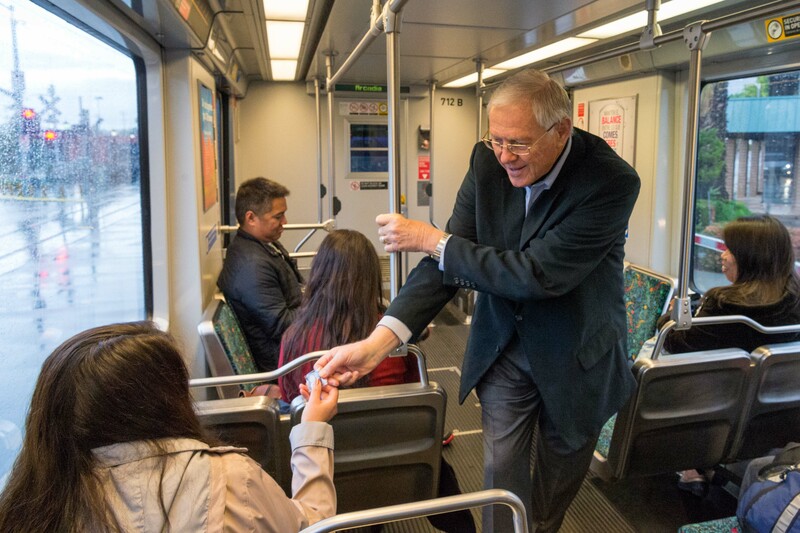 How ironic that Supervisor Antonovich was on the trains this morning when he has spent decades fighting increased transit service throughout the County and was a major OPPONENT of Measure R, which made this line possible!! Supervisor Antonovich has been undisputedly a supporter of this project. There was a lot of politics surrounding Measure R involving many different parts of the county, with many of the issues involving the amounts of money going to different parts of the county and project sequencing. Steve, an objective scan of Metro board meetings and Antonovich’s voting record clearly show how anti-transit he is. Sure, he ended up supporting this project because it’s in his district, like any politician, even a staunch conservative, would do. But on the whole, and as a principle, he has always been against increased transit funding and for any highway spending, at to the detriment of transit. I try to avoid editorializing on elected officials and that sort of thing — that’s not my role here. That said, as someone who has attended or listened to most Metro Board meetings since 2008, I would not characterize him as anti-transit as I’ve seen him support many transit projects both in and outside his district. 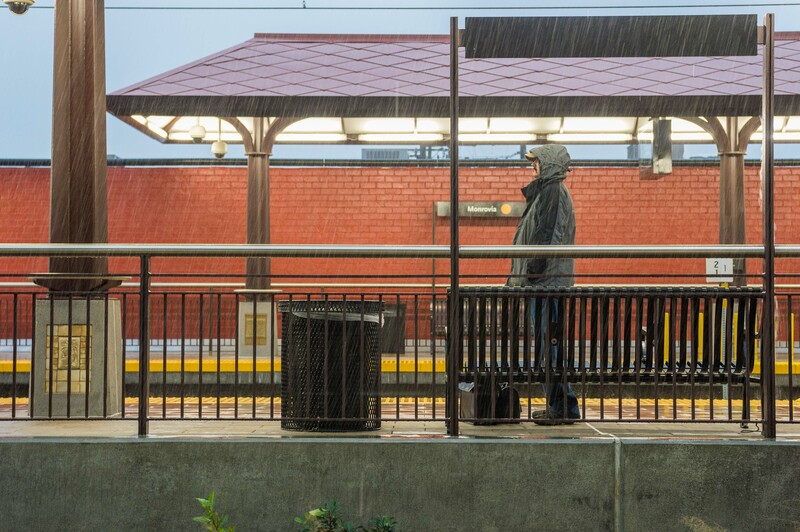 Among those projects: improved Metrolink service, better connections to airports, a Pasadena-NoHo bus connection and other Metro projects. Speaking more broadly, I think within the world of transpo funding there is an inevitable tension between those who want to see funding distributed equally on a geographic basis and those who would like to see more targeted spending on transit projects in certain areas with certain characteristics. I do think it’s fair to say that he has fought very hard to ensure that revenues from his district are spent there. I also think it’s fair to say that’s not an unique viewpoint. Unless there is real rail-focused development – a Target over a parking structure and two and three story townhomes don’t count – these stations are going to need a lot of parking. 1500 spaces is less than the parking at a single BART station in the Bay Area. But free parking is a right guaranteed in both the Constitution and the Bible, is it not? How ironic that the man (Antonovich) who got his seat mocking “Baxter’s Choo Choo” now supports spending other people’s money to extend rail well into another county. One more car on rush hour trains would be a real plus. Are there really no access to these stations other than driving there? If ridership is so dependent on people driving and parking at the station then the investment Metro put into building this line is a waste. It becomes nothing but a novelty train that a few Foothill residents would occasionally use to get to downtown. There are many homes and condos near stations. There are also folks who don’t live close to stations who want to use the train and, thus, demand is high. The San Gabriel Valley is a very big, very populated area. Yes, for most people, there is no practical access other than driving there. Buses run very unpredictably and adds to the commute time such that I would just drive as usual at that point. Also, for the APU/Citrus station, there is not even direct bus access because somebody dropped the ball big time and didn’t finish development of the intersection that would be the main access route. Instead, right now, you have to go through a residential area to get in/out (and I’m sure the residents are happy about that). You can’t even get to the college campus right across the street due to the delayed construction. There is a shuttle for the nearby colleges, but that’s not an option either for most people. Somebody should be held accountable for this poor planning. Thank you Steve, I just finished reading an older SGV Tribune article you linked about future developments being planned around the stations. Hopefully the stations will be fully utilized in future housing developments. Does Metro have any say in how developments are planned around the Metro rail stations? Metro only has a say when it’s Metro-owned land being used for the developments. The project was built by a different agency — the Foothill Extension Construction Authority (which handed it over to Metro to operate) — and in this case, we don’t have any parcels left over from construction as far as I know. The zoning is really driven by cities. I do think that ridership will continue to be strong on the extension and that, in turn, will help encourage developments around the stations and, equally important, better connections into surrounding communities. And so they made APU/Citrus parking one of the smallest. Makes perfect sense! I”m glad that the city of Los Angeles is moving towards a better method of transportation, but since ridership is going up? Shouldn’t more train cars be added to the Gold Line. It seems 4 during the hours or 7-9 and 4-6 is not enough. Google Maps is still showing a downright bizarre routing of the Gold Line on its transit layer, showing it as almost a loop connecting SMV and Atlantic, with a gap between Pico Aliso and Mariachi Plaza. And it’s not showing the new extension. Thanks for bringing that to our attention. Just looked and seeing the same thing. I’ll let your tech folks know — Metro provides Google with data but Google does the data crunching and maps. Now if LA could just get a simple train to the AIRPORT like the majority of other major metropolitan cities. We’re working on it. A station will be added along the Crenshaw/LAX Line to connect to an airport train that LAX is building that will have three stations near the terminals. It’s a few years away, but those are the plans that everyone has agreed upon. 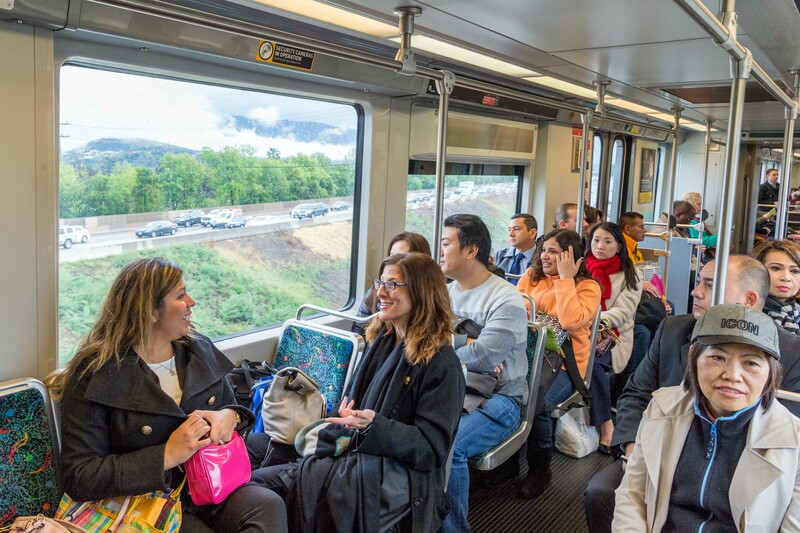 The Gold Line extension has so far proven to be a blessing for San Gabriel / Pomona Valley residents…those tired dealing with traffic..or even as an option to save money rather than Metrolinks costly tickets. Beneficial especially the Downtown LA commuters. In my opinion i think the 12 minutes is the usual “play-it-safe/testing-the-waters” frequency, as they probably didn’t expect the line to exceed expectations this early. With that being said, I think the demand is as similar as the Metro Blue Line is and still is today ( and god only knows what the demand will be like on the Expo Line to Santa Monica once that extension opens ). Unrelated to Metro, for other transportation alternatives around stations, I think Foothill Transit should, if they havent done so, evaluate their ridership or maybe consider feeder/community routes from stations, making it easier for people to get to stations. Perhaps Metro should also have posters on trains regarding transit connections vs strip maps. Are the two-car trains because of the delay in getting new cars for the Gold and Expo line extensions? I seem to remember TheSource writing last year about a constraint like that during the opening of both extensions that would ease over time (i.e. cars could be added) as new cars arrived from the manufacturer. Here’s the staff report you probably saw mentioned on the blog: scroll down in the report embedded in post to see the part about revenue service. The report is now a year old. I think it’s fair to say that service frequencies and number of rail cars on trains is determined both by what’s available and the Metro budget for staffing. I’ll keep an eye on this issue — many people are asking about it — and will let everyone know if there’s any change in plans. I was going to ask a similar question about the delivery delays, and I would like to read that staff report, but I didn’t see a link in your response to Michael. Did you forget to insert the link? My research shows that Kinkisharyo was supposed to deliver 28 rail cars “by 2015” and a total of 62 rail cars by May, 2016. According to a fluff piece in a business blog, they have delivered 21 cars so far. I think this explains why Metro is running two-car trains on the Gold Line Extension, with service every 12 minutes, and why they cut back to two-car trains on Expo a few weeks ago. By my accounting, Metro could have extended both the Gold Line (with 2-car trains and 6-minute headways to Azusa) and Expo Line (with 3-car trains and 6-minute headways to Santa Monica) with 50 additional rail cars in their fleet. I think this explains the original schedule to deliver 62 cars by May, 2016, which would include 50 cars in revenue service and 12 cars as spares. They need several months of testing the new cars before they can put them in service so even if cars have been delivered, it takes a bit longer to get them out there in the field. Assuming the new Gold Line ridership doesn’t taper back, I’m uneasy about Metro’s proposed frequency for the Expo Line after the DTSM extension is completed. I expect a large ‘reverse commute’ load to come off of I-10 and onto Expo. Likewise on weekends there is this minor destination called THE BEACH that attracts a wealth of traffic, not to mention the 3rd St Promenade etc. After the connector is built trains will run through north/south and east/west; unequal headways have to resolved preferably with more frequency. Metro needs to revisit its projections and hopefully bump up car procurement and staffing in anticipation. The Gold Line will be the new Blue Line. Packed with people going to DTLA during the morning and evening rush hour. I’m happy to see Metro updated the system map and go Metro map on the website, but they should also update the under construction map and the Metro and Metrolink map to reflect that the extension is operational. While we’re at it, it would also be a good idea to fix the geometry of the regional connector in the under construction map, and make that map the default (and also include under construction segments in the system map). Final comment on the system map: APU/Citrus College just sticks out to the right, while the main map only goes as far east as Azusa Ave; it would have made sense to extend the map to Citrus Ave. I have been a regular Gold Line rider for a few years now. Since the opening of the gold line extension this week, its apparent there are more riders and with that said, why are there the same amount of cars carrying twice as much or more riders than before? This has made my commute to work inconvenient. I live very close to the gold line station and now I have to add in more time to my commute and this is just the second day in. Is Metro going to add in a few more cars carrying riders from Azusa to Downtown Los Angeles? Seems logical to me! Can I just point at that while I appreciate the ladies pictured in the 3rd photograph down appear to be enjoying their ride, it would be nice if their bags and personal effects were not taking up the seats next to each of them. Someone might actually like to sit there! If “Metro has seen time and again that the stations at the end-of-the-line are busy and see a lot of riders and parking demand.” Why was it designed with only 200 parking spots while other stations further up line get 300 and 350? Can someone please explain why government projects take s9 long to complete here in America? I can understand the development phase, but once building begins why isn’t it completed in a year? We can see projects around the world from Moscow to Shanghai to Dubai being finished in record time. Yet here in America where people need jobs we have 50 people working 7 years on a project. Why not put 1000 people on the project and be done in a year? The 605/10 overpass took years to complete, yet would be a couple month project anywhere else. The job security of these project officials really need to be looked into. You answered the question in your own statement, how would you find 1000 people to do heavy duty work for one year if you can pay 50 people to do work for 7 years? If you are the construction company, you want the long term job. JakeJohnson It took the LACTC three or more years to build the Blue Line to Long Beach. In contrast, it took Henry Huntington six months to build the same line in the early 1900’s with primitive construction equipment. But of course he started from both ends at the same time in addition to the crews taht started mid-line. Can someone please explain what the information on the screens at the stations represent? I see a big gold circle with a station name and a time in minutes. If Im standing at South Pas station I’ll see what appears to be two randomly odd station names and times. None of the information correlates to anything. Trains come and go, yet two weird station/times adjust which means nothing to the station Im standing at. I take metro once in a while and my wife takes it often. She nor anyone we’ve asked can figure out the screens. We’ve traveled extensively and metro stations around the world are simple to read and they show when the next train arrives! Such a clever idea! Why cant Metro be so simple? The minutes are a countdown to the next train arrival. If the times are off on the screen, you can report using the platform intercom (or once on board, you can use the intercom to inform operator) so staff can resolve any issues. Hope this helps! Is anything being done at Union Station to clarify which destination an arriving train will take you to? The displays on the platform have been inaccurate, the signboards on the trains don’t change until they are leaving the station, and the operators (at least the last two trains I’ve been on) make no announcement before leaving the station whether they are stopping at Sierra Madre Villa or going to Azusa/APU? Also, why are we only getting half the service the rest of the line receives? We pay the same fare, but our trains only run every 12 minutes at rush-hour but elsewhere they run six. I’ve been driving to the Sierra Madre Villa Station for years waiting for the extension to arrive. So far, it has taken longer to get home taking the train to Duarte than taking the train to Pasadena and driving in rush-hour traffic to get home to Duarte. That doesn’t seem right. I know Union Station is a mess right now with Little Tokyo/Arts District being closed for construction, but the lack of clear communication, over-crowded cars, and multiple trains coming through stopping at Pasadena before a train comes through that goes the full route is not going to encourage people taking the Gold Line for the first time to consider it a real alternative to driving. I know this is the first week, and I know most of us have been waiting a very long time for this most-needed extension, but let’s get the bugs worked out Metro! I think I read someplace that the gold line would be running a non peak schedule for a while after that fire on the 210 freeway. I wonder how long they plan to do that. I used to travel on Metrolink from Covina to Union Station and switched to Gold line this week because i live relatively close to APU and the 15 extra minutes on Gold line would have balanced out the time to drive to Covina Metrolink station from N Glendora. – APU/Citrus station parking is full by 6:30-6:45am. There is no street parking anywhere around the station, it being part of Rosedale community which requires permit parking. Needing to hop on a shuttle first to get to the station is just going to add more steps and time to an already long commute. – Trains are definitely packed by the time we reach Sierra Madre, i feel for the passengers boarding there. Ultimately the success of and adoption of Metro will depend on these practical aspects. The 200 spot parking at APU is laughable to be honest, any budget considerations notwithstanding. I might have to revert back to Metrolink once Azusa runs out of parking…doesnt make sense for me to keep on driving to the Irwindale station. Took the gold line, and red line, to and from work in Hollywood two days this week. Overall, I really liked it. However, small complaint about the commute home on the rail. The first night, Monday night, a bunch of us got on the gold line at Union Station to head east. The announcement kept saying that this train would stop at Monrovia station. However, we got off at Arcadia instead, mostly by luck. We noticed that we had stopped for a bit, and saw a Metro employee running back and forth on the platform while a train was parked on the other side. Eventually we got out to ask what was happening, and he said that this train we were on would be reversing course and heading back to Union Station. Luckily, we avoid heading West again. Then we had to wait for a new train for about fifteen minutes. Then once boarded, we had to wait before really heading eastbound again, as there was a train pulling into the Monrovia depot that kept us waiting on the tracks. After that it was smooth sailing. Tuesday night… Again the east bound train we got on terminated at Monrovia. Question is if that will be regular? I had boarded the gold line heading east around 8pm both night. Will that train always terminate at Monrovia? Experienced this also. If you look at the Gold line schedule you’ll see some trains end somewhere along the line and others continue on to the APU/Citrus. The train should be announcing this fact when its boarding at Union Station. First off, my commute is only to Sierra Madre Villa, not Azusa. That being said, I decided to wait until Tuesday so I could somewhat avoid the crowds and just enjoy what was just going to be a leisure ride. I arrived at Sierra Madre Villa after getting off work at around 5pm, knowing that initially I would be traveling in the peak-direction, I knew the trains would be packed but once I got to SMV I didn’t realize how packed those trains were going to be. There were at least 30-40 people waiting at SMV, a station that until this week was normally empty, waiting for an Azusa/Citrus train. I waited about 3 min, train arrived, already packed, but everyone that was waiting at SMV managed to get on. First thing I noticed once we began to travel east, there was hardly anyone hopping on, even though there was plenty of room, it was mostly people getting off. I arrived at Azusa, walked around the area for a bit, got myself a bite to eat, and proceeded to go back home. Again, the leisure ride that everyone got on Saturday, I got on a normal weekday. One other thing to add in this section: What is up with the trains randomly slowing down in Monrovia and Duarte?? Do these trains actually beat their schedule at one point. The train just kept slowing down with no real explanation. Now comes the part where I understand why the current 12 min frequency is in place, and even though it doesn’t affect me, I still don’t like it. I arrive back to the Azusa station at around 6:30pm, train arrives 2 min later, and as soon as the train pulls into the station, it finally hit me: The reverse-peak trains are running almost as ghost trains from Azusa. There were only 2 people in the rear car when the train pulled in, and only about a total of 4-5 people hopped on at Azusa – Downtown. Meanwhile, a peak-direction train also arrives as we depart and it’s PACKED. Between Azusa and SMV, the number grew VERY slowly. Finally, by the time we arrived at SMV, the train began to get fill up and my normal commute finally began to feel. . . normal. It was not a standing room only train, but seats were definitely getting filled ONCE we arrived West/South of SMV. So, after that initial ride I can understand why Metro isn’t running trains every 6 min between Arcadia and Azusa. I know basing this on one train ride is wrong, but so far I also don’t think it makes much sense to be running ghost trains every 6 min even though the peak-direction trains are full by the time they are halfway to point B. However, before everyone begins to bash, I also don’t think this current peak schedule on the Gold Line makes sense either. Do I believe Metro should also run 3-car trains during rush hour?? Most definitely!!! A) Running 3-car trains during rush hour BUT, don’t run them every 6 minutes. Instead, get rid of the LAUS-SMV short line and increase the frequency to perhaps 9-10 min on the entire line. Yes, there will be 3-car ghost trains running, but at least peak direction commuters won’t feel the burden of having to shove through standing room only trains. In due time, those reverse-peak trains will begin to fill up with more riders. So far, the mid-day trains don’t appear to have any capacity issues from my experience these past 2 days. B) Don’t run 12 min, 2-car trains on the Expo Line once phase 2 opens. Take a lesson from the Orange Line, those trains will begin to fill up quick and will hit the projected ridership in no time. Lastly, perhaps it is possible that patterns will change over the next few weeks, but that may not necessarily mean for the better either. You hit the nail on the head. The area is really more suited to commuter rail service like Metrolink not light rail. One way demand with most everyone needing to arrive via car and hence need parking, shouts commuter rail. It is expensive to run empty trains like those going out to Azusa every morning. Maybe I’m mistaking but I read somewhere that Metrolink was originally going to run Commuter Rail service on this ROW. But apparently Pasadena wanted to be more modern and insisted on light rail instead. It was only going to take Metrolink a few weeks after the Northridge Earthquake to begin service on the ROW, but instead LA had to wait almost a decade to finally see rail service restored on the ROW. Hence why we now have LRT with the ridership of CRT (packed peak direction trains, empty reverse peak trains). I’d like to see sourcing for that, if true. I’ve been waiting for this extension for almost that long (I was living in Monrovia about 10 years ago, near the current station. I’ve since moved, but am now near another station, so it worked out… but I’d have loved to have been doing this sooner). Once Rosedale finishes its half a block road to Citrus Ave, we should be able to park in the Citrus parking and just walk across to the station. unless a permit is required. A permit to park there seems ridiculous since the parking area is always completely empty over the last 10 years of driving by at different hours. The Citrus parking is really for the Citrus students and they will charge you the normal $5 a day to park there, unless you register for classes and buy a parking permit for much less. Might be worth it to take one online class just for the parking! We might have to register as students to get a decent parking rate. Visitors pay $5.00 a day at the Citrus College lots. Metro really should be working with Citrus College on this one! That entire northwest parking never has anyone parking there. Another way of looking at the parking ‘big’ picture – commuters coming from SB county have poor or no bus bridge alternatives. SANBAG / OmniTrans is very biased against serving east SGV points, their world revolves around someplace between Rancho Cucamonga and downtown San Bernardino. The truth is MTA wasted 2 years in getting orders for new light rail cars. MTA does NOT have enough LRT cars to facilitate longer trains or more frequent service for Gold Line beyond Sierra Madre Villa. I believe we have to put up with this for many months (near the end of the year) before sufficient number of cars are delivered to MTA. The more expensive bid by Kinkisharyo was selected because MTA staff stated they had never been late with a delivery in the USA for metro or LRT cars. Does anyone know if Kinkisharyo is, in fact, not late on milestone and delivery dates AND RATES of delivery? According to documentation that I’ve seen, dating back to early last year or before, Kinkisharyo was supposed to deliver 28 train cars “by 2015” and another 34 cars by May of 2016. This would be enough to serve both the Gold Line to Azusa with a two-car train to Azusa every 6 minutes, and the Expo Line with a three-car train to Santa Monica every 6 minutes. According to an article that was probably written by the Kinkisharyo PR department, so far they have delivered 21 cars. So even though they put a very positive spin on the delivery, it appears to be far behind schedule. Those 21 cars aren’t close to being enough to fill the needs of the Gold Line and Expo Line, even while Expo Phase 2 is still in the testing phase. Along with the reduced service on the the Gold Line extension, the Expo Line has seen a reduction in service in the past few weeks, with most peak trains including only two cars, instead of the three-car trains that have operated since the introduction of Expo services. Expo also revised their schedules a few weeks ago, and I’ve heard operators complain that now they don’t have time for a break when they arrive at the Culver City terminal. Their scheduled layover used to be 11 minutes at Culver City, but now it is 5 minutes. I haven’t seen any newspaper articles about the Kinkisharyo delivery problems, and The Source hasn’t volunteered any information either. We need an investigative reporter (Hello LA Times!?!) to dig into this matter. Can Metro post a Tweet once each Azusa lot becomes full in the morning? Would help to know which parking structure to head . 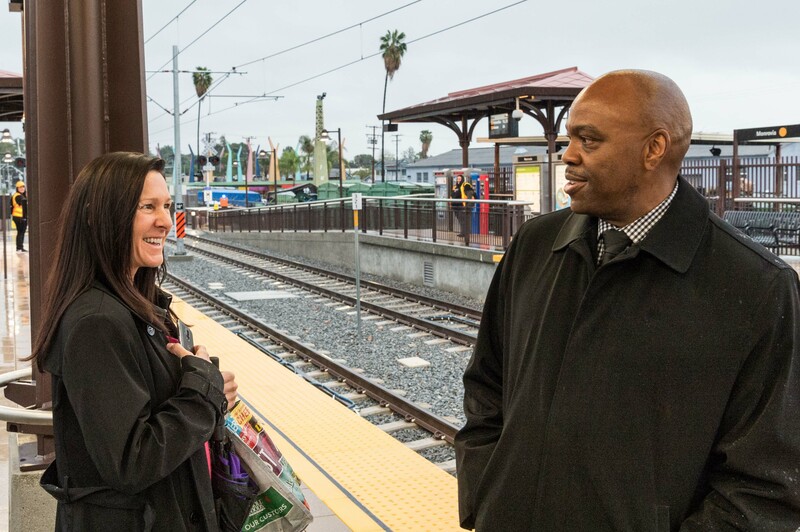 Metro has done a tremendous job of attracting new riders to the Gold Line, but rides are now crowded and often delayed. I waited 13 minutes for a train at South Pasadena this morning at a time when they’re supposed to come every six minutes. When the train did arrive, it was SRO. I suspect that by the time this evaluation is conducted a lot of otherwise interested potential riders will have been dissuaded from using the service because this first week has been, frankly, horrible. If Metro wants to attract and keep larger numbers of customers, they should have assumed the cost of longer trains up front and then decreased capacity later if it could be shown that the longer trains weren’t necessary. Metro is squandering an opportunity to show new riders what a pleasant experience it can be to take a comfortable ride rather than driving. This first week of service is showing everyone that the criticisms of public transportation are accurate–crowded trains, infrequent service. What time were you traveling? Good to know when I gather up anecdotes such as this. Thanks! $48,000,000 /1,500 parking spots = $32,000 per spot. Suburban Transportation Math astounds me. Knowing that terminus stations attract the most riders, and still going with a 200 car parking structure, I would get fired for that. Otherwise, I must say the Goldline Extension is a thing of beauty. I hope they don’t wait too long to add rail cars. They don’t want the same backlash that Metrolink has had. I think the clock at the station said 6:01 when I arrived. Yeah, charge for parking. That will cut down on people parking, plus the additional funds can help for expansion and maintenance. As for the extension, I am interested to see how Saturday goes for parking. Since people typically ride less on weekends, and metro rides is more for events, conventions, doing touristy things. I might ride the metro in lieu of parking for Wondercon at the end of the month, but I am curious about metro parking capacity on weekends to determine whether it is worth it or not. I have to agree, don’t take a month crunching numbers while potential riders are getting a bad whiff of too many people in close quarters.The time to add cars was right after Monday’s wall to wall rush in the morning. From Downtown Azusa, you can take the new Foothill Express 496 to L.A. The question is for those of us who already have a Silver Line or Silver Streak Pass, can we ride it for free. If the Silver-to-Silver program is also good for Foot 481 Metro 489, then will the Silver-to-Silver add this new line because it running a similar route to the Silver Streak. This addition is needed because the trains are already over crowded. This will provide a one-seat free ride to Cal State L.A. and the Financial District.